The Berlin Philharmonic Wind Quintet (Philharmonisches Bläserquintett Berlin) was founded in 1988, during the era of Herbert von Karajan, the first permanently established wind quintet in the famous orchestra's rich tradition of chamber music. The members are living musical witnesses to the hugely productive and influential musical partnerships of the Berlin Philharmonic not only with Karajan, but also with their more recent Musical Directors Claudio Abbado and Sir Simon Rattle. Naturally, as members of the Berlin Philharmonic, they have also enjoyed important collaborations with every other major conductor of their times, whether Leonard Bernstein, Carlos Kleiber, Sir John Barbirolli, Günter Wand, Carlo Maria Giulini, Bernard Haitink, Riccardo Muti, Pièrre Boulez or Daniel Barenboim, to name only a few. The Berlin Philharmonic Wind Quintet continues to astonish audiences worldwide with their range of expression, their tonal spectrum and their conceptual unity. Indeed many listeners and critics agree that the ensemble has succeeded in virtually redefining the sound of the classic wind quintet. Their repertoire covers not only the entire spectrum of the wind quintet literature but also includes works for enlarged ensemble, i.e. the Sextets of Janáček and Reinecke or the Septets of Hindemith and Koechlin. In addition, the collaborate with pianists such as Stephen Hough, Jon Nakamatsu, Lars Vogt, Lilya Zilberstein und Ewa Kupiec. The ensemble's commitment to the wind quintet repertoire is passionate and in 1991 they found the perfect partner for their recording plans, the Swedish company BIS Records, already well known in its own right for its uncompromising standards. The results of this long and exclusive collaboration have received critical accolades worldwide - indeed many of these recordings are already widely held to be "definitive" or "reference" performances. 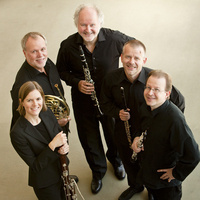 In addition to their concert appearances throughout Europe, North and South America, Israel, Australia and the Far East, the Berlin Philharmonic Wind Quintet are also popular guests at international festivals such as the Berliner Festwochen, the Edinburgh Festival, the London Proms, the Quintette-Biennale Marseille, the Rheingau Festival and the Salzburg Festival. Their television productions and radio broadcasts are seen and heard throughout Europe, Asia and North America. In recent years the members of the Berlin Philharmonic Wind Quintet have intensified their teaching and coaching roles with youth; they have given chamber music workshops and instrumental instruction in many countries, with a particular commitment, for example, to the youth orchestra programme of Venezuela.